The genomes of eukaryotes associate with histone proteins to form chromatin. Chromatin is the substrate for all genetic processes and as a result of fundamental importance to a diverse range of biological processes including development and disease. Indeed chromatin is currently of significant interest both in the development of biomarkers for diseases and as a source of new therapeutic targets. Eukaryotes use a range of strategies to alter chromatin structure. These include the use of histone modifications, histone chaperones and ATP dependent remodelling enzymes. We are generally interested in how these different strategies are coordinated to ensure appropriate gene regulation. Figure 1 Organisation of transcription and chromatin proteins with respect to the Transcriptional start site (TSS). Nucleosomes,histone modifications, histone chaperones exhibit distinct distributions with respect to transcribed genes. Adapted from (Owen-Hughes and Gkikopoulos 2012). The application of rapidly developing genomic approaches to study gene regulation has revealed a common architecture shared by large numbers of transcribed genes. This consists of a nucleosome depleted region just upstream of the transcriptional start site, and an array of well positioned nucleosomes extending into the coding region (Figure 1). We have found that a combination of the Isw1 and Chd1 chromatin remodelling enzymes play a major role in maintaining this organization in yeast (Figure 2). These observations raise many questions. For example, how is the action of these enzymes coupled to transcription? How is the chromatin of non transcribed regions organized in higher eukaryotes? Projects aimed at addressing these issues are ongoing. We are also interested to learn at a molecular level how chromatin remodelling enzymes and histone chaperones engage with chromatin. For example we are using combined structural approaches to model the overall organization of the Chd1 protein and its interaction with nucleosomes. These include X-ray crystallography, which we used to solve the structure of the C-terminal domain of the Chd1 protein (Figure 3). We are particularly interested in using Electron Paramagenetic Resonance (EPR) to dock domains of known structure with respect to each other. An example illustrating how we have used this to study the conformation of chromatin when associated with histone chaperone proteins is shown in Figure 4. 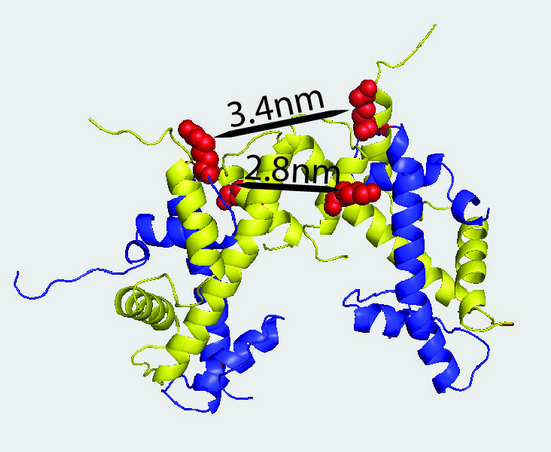 The histone chaperones Vps75 and Nap1 form ring-like, tetrameric structures in solution. Probing the (H3-H4)(2) histone tetramer structure using pulsed EPR spectroscopy combined with site-directed spin labelling. The Histone ChaperoneR. s Nap1 and Vps75 Bind Histones H3 and H4 in a Tetrameric Conformation. Acetylation of histone H3 at lysine 64 regulates nucleosome dynamics and facilitates transcription. The spatial effect on protein deuteration on nitroxide spin-label relaxation: Implications for EPR distance measurement. Nucleosomes can invade DNA territories occupied by their neighbors. SWI/SNF and Asf1p Co-operated to displace histones during induction of the Saccharomyces cerevisiae HO promoter. A Role for Snf2-Related Nucleosome-Spacing Enzymes in Genome-Wide Nucleosome Organization. Modelling multi-protein complexes using PELDOR distance measurements for rigid body minimisation experiments using XPLOR-NIH. Direct observation of DNA distortion by the RSC complex. Cell Aug 1;154(3): 490-503. doi: 10.1016/j.cell.2013.07.011. Review. Making sense of transcribing chromatin. The DNA-binding domain of the Chd1 chromatin-remodelling enzyme contains SANT and SLIDE domains. Long distance PELDOR measurements on the histone core particle. 4 Year Wellcome Trust Programme: The functions of mammalian SWI/SNF related chromatin remodelling complexes.